I think my hands are finally defrosted enough to write this post. 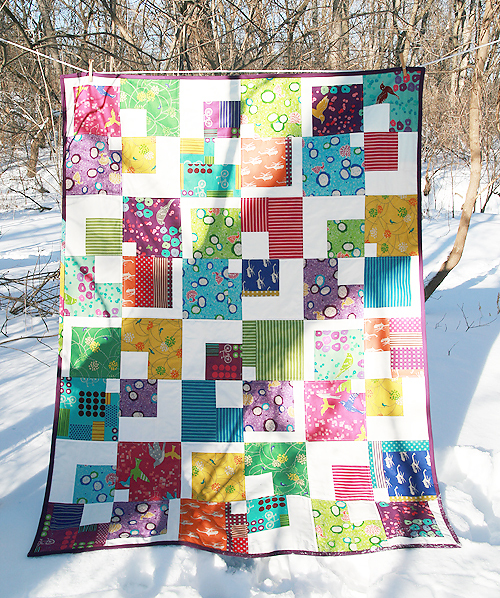 Just when I thought Mother Nature couldn't make it any harder to take quilt photos, she threw us 2+ feet of snow (3+ foot drifts!) and I'm pretty sure it's about 10 degrees outside right now. And I seem to have misplaced my gloves. 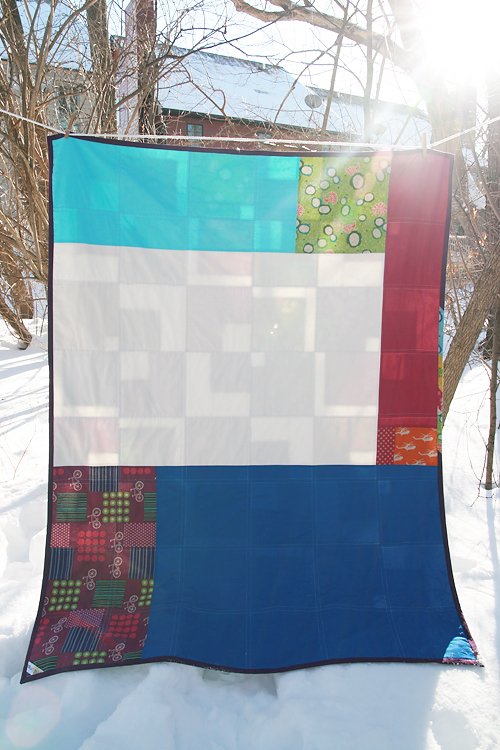 But of course that wasn't about to stop me from braving the elements and getting a picture of this great new quilt. I know I looked hilarious out there, dragging a clothes line, clothes pins, my camera and a quilt through all that snow in my backyard, practically falling every other step. I bought this Echino fabric a loooooong time ago. I was scared to use it on the wrong project. It's just a *tad* pricier than regular quilting cotton. Finally one day I was sketching out ideas and came up with a design I thought would feature the large scale designs and bright colors perfectly. 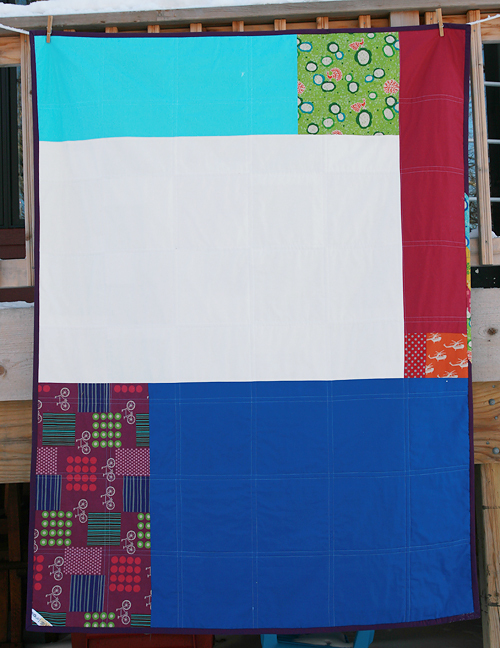 Each block is 9", making the final quilt 54" x 72". 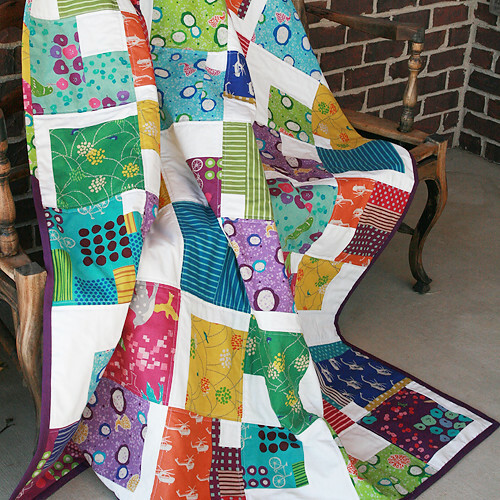 I quilted this one with straight lines 1/4" on each side of the vertical and horizontal seams with a 3.5 stitch length. My initial plan was also to do diagonals through all the blocks, but I did one and wasn't feeling it. I picked those stitches out and called it a day. The binding is a Kona cotton with a bit of Echino pieced in on the top left. 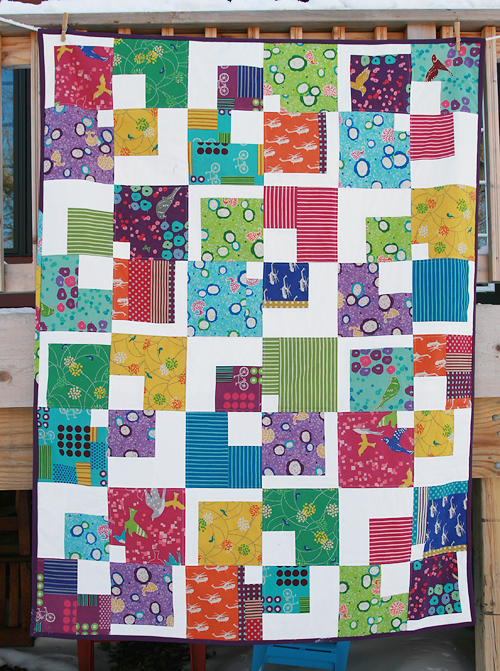 The back is a selection of Kona solids mixed with large blocks of Echino prints taken from the front. The white used on the front and back is actually Kona Snow - a softer white. Call it cabin fever, but I just picture the kids and me lounging on this quilt in the sun when it's about 75 degrees outside. And to celebrate finally using some of my Echino stash, I plan to have an Echino giveaway on my blog later this week. Be sure to check back to enter!